OLYMPIA, Washington – Washington became the 14th state to protect student journalists and their free speech rights by passing a New Voices bill on March 21. Gov. 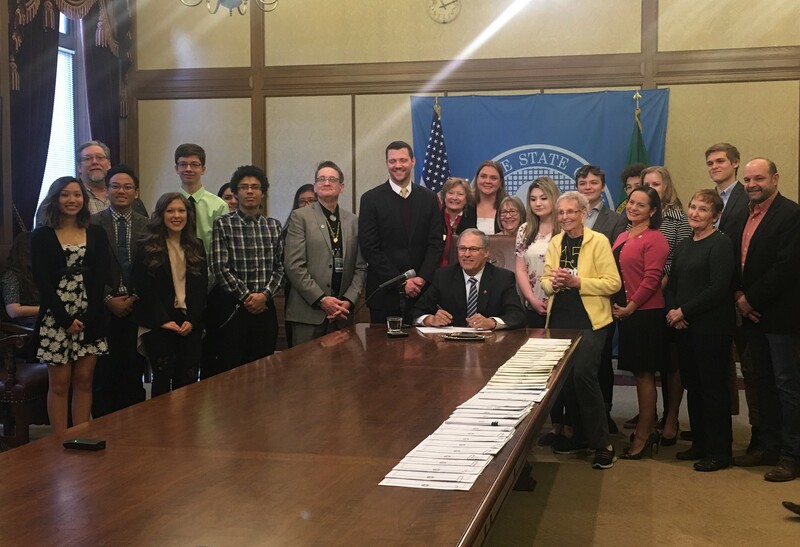 Jay Inslee signed SB5064, which states that student journalists should be free from school censorship if their reporting is not libelous, illegal or invading anyone’s privacy. The other states that have passed New Voices legislation are Arkansas, California, Colorado, Illinois, Iowa, Kansas, Maryland, Massachusetts, Nevada, North Dakota, Oregon, Rhode Island and Vermont. Washington’s law, which makes high school and college editors responsible for content in the school newspaper, yearbook and other media, also provides legal protections for faculty advisers and journalism teachers. The Washington, D.C., nonprofit Student Press Law Center (SPLC) introduced the New Voices movement in 2015 after the successful passage of North Dakota’s John Wall New Voices Act. “We need young people to be asking hard questions and to be holding power accountable in the best possible ways,” SPLC Executive Director Hadar Harris said. School newspaper editor Madison Morgan of Kennewick, Washington, testified in support of the bill in February in Olympia. “I want to go into journalism because I feel like that’s where I can best make a difference,” said Morgan, a senior at Kamiakin High School in Kennewick. Republican state Sen. Joe Fain of Auburn, Washington, was the lead sponsor of the Washington bill. The law goes into effect on June 7. Earlier this year, Indiana’s New Voices bill (known as HB1016) was shot down. In the meantime, New Voices bills are pending in Missouri and New York. Earlier this year, using the #CureHazelwood hashtag, the SPLC launched A Day of Action to bring awareness to New Voices and the landmark US Supreme Court decision Hazelwood v. Kuhlmeier that has had a chilling effect on student editors covering potentially controversial stories. Since Hazelwood was decided in 1988, the SPLC has handled an increasing number of censorship reports from students who say principals or administrators are pulling stories, requiring prior review or are otherwise dictating media coverage. Jennifer Karchmer, a member of the SPJ Western Washington Pro chapter, serves as Secretary of the SPJ Freelance Community. Jennifer covers New Voices, freedom of the press and First Amendment issues. Website: www.jenniferkarchmer.com. Happy 109th Birthday, SPJ! Here are 109 things we love about you.